I've been travelling the outback with my monkey and whilst I've been gone so much has happened. Apple had the WWDC, Microsoft is sending Azure to the bottom of the ocean and Github has been acquired. I just wanted to take a moment to thank you all for taking the time to read this newsletter each week. Your interest and love is what motivates us to want to share what we love with you! I also want to thank all the awesome authors who write articles and create content we want to share with you, we would not exist without you! The Xamarin/DotNet community is one of the best and I hope you enjoy being part of it as much as I do. Enjoy this week's issue, lots of great stuff for you to read and listen to. Microsoft announced an agreement to acquire GitHub, the world’s leading software development platform. What does this acquisition mean for our industry and for developers? This is the official blog post from GitHub about the acquisition so you can hear the opinion of both sides. WWDC Happened! Here is a good source for links to the interesting announcements and details from WWDC. Lot's happening at Xamarin University with New Courses, Lightning Lectures, a bunch of upcoming Guest Lectures and Badges to add to your collection! Check out what's new. David Ortinau walks through the Conference Vision App that was built for the Build 2018 conference. It's got some great little tricks and tips in there and showcases some of the new features of Xamarin Forms 3.0. First impressions matter! How do you design a delightful Splash Screen for your app? Check out some ideas and guidelines. Getting your app onto your own device, or in the hands of potential testers, can be one of the most time-consuming challenges when developing an iOS app. To install an app on a single device, you must register the device with Apple and sign the app with the relevant provisioning profile. While this isn’t much of an issue for a single device, you need to register and re-sign the app each time you install the app on a new set of devices. For a developer, this repetitive action is a huge loss of time; for a tester, it’s a disruptive experience to receive an app and not be able to install it because your device hasn’t been provisioned, yet. App Center has announced the release of auto-provisioning capabilities, enabling iOS developers to spend more time creating and shipping great apps, rather than managing device provisioning. With the new auto-provisioning capability, you no longer need to know the device IDs of testers, coworkers, or stakeholders when building a new beta version of your app for testing. We’ve integrated this capability directly into the install portal, so you can automate the distribution process and enable testers and team members to install your app with one click. Glenn Stephens got asked if there are any particular tools that he likes to use. Tooling is an important issue, just like you would make sure your IDE is as productive as you can, as mobile developers we need to use other tools from time to time. Here are the ones he uses on a day to day basis. Running tasks in the background is important for Android apps. It’s what helps keep an app responsive to the user and allows work to get done even when the user isn’t actively engaged with the app. As an example, consider uploading a large file or trying to apply a filter to a picture. Near the end of yesterday's WWDC keynote, Craig Federighi, Apple's senior vice president of software engineering, acknowledged that people have been asking for a long time whether Apple would ever merge the iPhone and Mac operating systems. His short answer? "No." How about some more Material Design based controls for Xamarin.Forms? Alex Dunn doesn't disappoint. Try the Latest Release of Xamarin.Forms 3.0! Here comes the latest stable release of Xamarin.Forms, version 3.0. This is our fastest, richest release to date coupled with fantastic improvements up and down the Xamarin stack such as the latest XAML IntelliSense experience in Visual Studio 2017. Read more about it here. Since the beggining of the time ( 2014 For Xamarin.Forms ) It was "difficult" display a TabbedPage on the bottom for Android in Xamarin.Forms but thanks to @mikescandy and @PureWeen the time has come to easily do this without a Custom Renderer or a NuGet package. So as mentioned by Luce herself, she became an MVP this week and decided to write a blog post on her journey and contributions for anyone interested in her story or how they too might join the esteemed ranks of MVP. We did it! 100 episodes of Merge Conflict! Somehow with your support Frank and James rambled their way through nearly two years of podcasting. We celebrate with questions from our listeners, some inside info on the podcast, chit chat about how we started, and a contest! James has also written a blog post to celebrate 100 episodes. 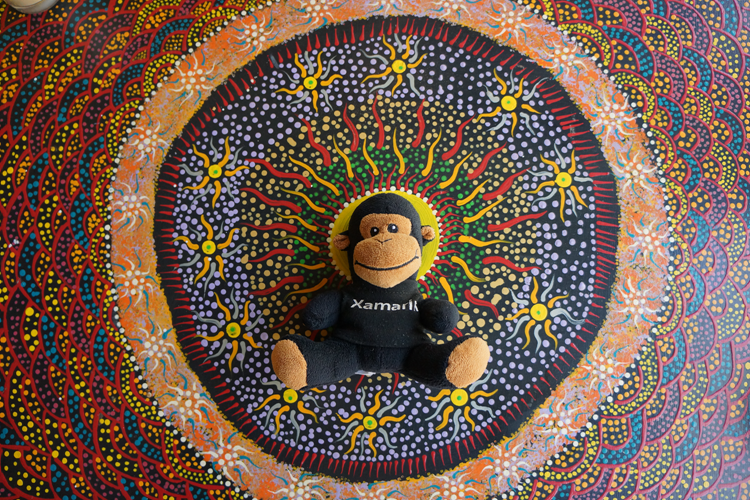 Have you got a good Xamarin Monkey photo... send it through.